At Masso Osteria, chef Scott Conant aims for casual elegance and happy people. The menu consists of inventive Italian dishes that Conant built his reputation on at the Cosmopolitan’s Scarpetta and D.O.C.G. “It’s about identifying a balance of casual dishes as well as luxury ingredients woven in,” the chef, who also does television duty as a judge on Chopped, says. 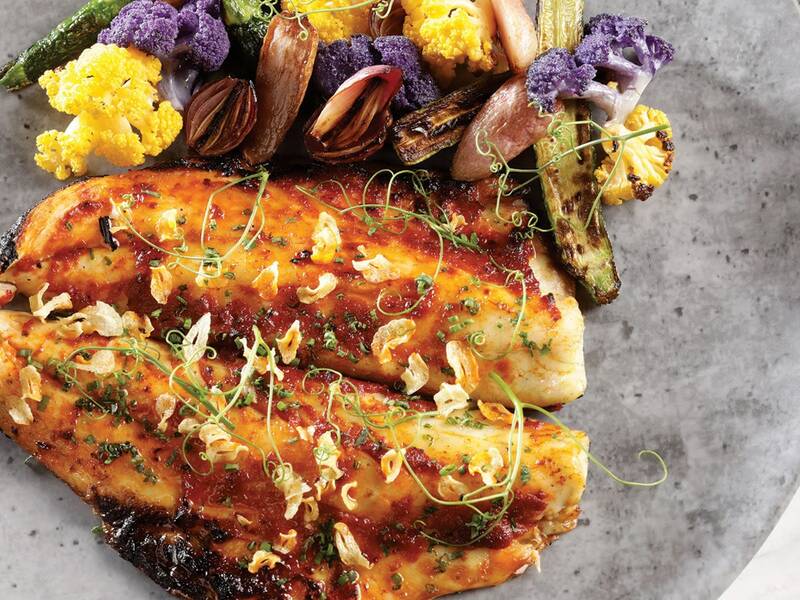 For the uninitiated or for those who simply can’t choose between the sea bass or the roasted chicken (you won’t go wrong with either), the $65-per-person tasting menu is the way to go, starting with the can’t-miss Recco-style garlic bread—a flatbread stuffed with warm melted stracchino—and the stromboli. And while it’s easy to load up on carbs, remember that 10 other dishes follow, including the chef’s signature pasta al pomodoro, which makes an appearance on almost every table. One twirl of the perfectly al dente housemade spaghetti enrobed in a rich tomato basil sauce and you’ll know why. The squid ink rigatoni is a hearty, briny bite, with a generous smattering of spicy king crab. But we’re getting ahead of ourselves here—before the pasta course come the salad and the hot appetizers, which here are the memorably creamy polenta and the perfectly tender wood-roasted octopus with guanciale and smoked potato aioli. Save room for dessert, because the cheesecake and the banana sticky toffee pudding will be competing for your attention. “I simply want everyone to leave happier than when they came through the door,” Conant says. From the first bite to the last, Masso Osteria delivers.